The year is coming to and end and it’s time to reflect on all the photos taken in 2014. It was a very productive year for me and it was hard to select 21 best shots of the season. The focus is on landscapes, rural scenes and nature with one exception of the shot from Ljubljana, my hometown. January: A farmhouse on a winter morning at Smrečje village. Never expected to get this shot, was going for a scenic view nearby, but it was in fog, so driving around I happened to be at the right place at the right time. February: Struška range, Karavanke Alps. Another sunrise that didn’t go according to plans (and weather forecasts). With Miro, my usual companion on mountain adventures, we climbed Struška for sunrise only to find out the peak is wrapped in clouds. This gave us incredible scenes later, when sun started to break through. February: Lake Bohinj – always beautiful and always unexpected photographic opportunities. This is late afternoon just after the snow has stopped falling. I must have been the only person there. February: Škrlatica and Triglav, the two highest peaks of Slovenia. Shot was taken while flying over Julian Alps for sunset light. See more photos here. March: Fritillary defying morning frost. One of the first flowers that pop out after a long winter, they are always appreciated. May: Ljubljana old town. This is one of the classic views of Ljubljana. I have photographed it from Nebotičnik cafe many times, this panorama is one of my best shots. love the gentle colors of the city and sky that match perfectly. May: Apple tree orchard, photographed at a small village near Lake Bled. This is typical Slovenian countryside, orchard and a pasture at the same time. Sunrise. May: Gorenjska region. Soft morning light, mists, meadow flowers, grazing cow, a beautiful photo. June: Lepenjica river, Julian Alps. This river is such a jewel! While Soča might be very busy in the season, Lepenjica remains wild and quiet. Except for an occasional fly-fisherman going for a marble trout there is hardly any people there. July: Sunrise at Križna gora. 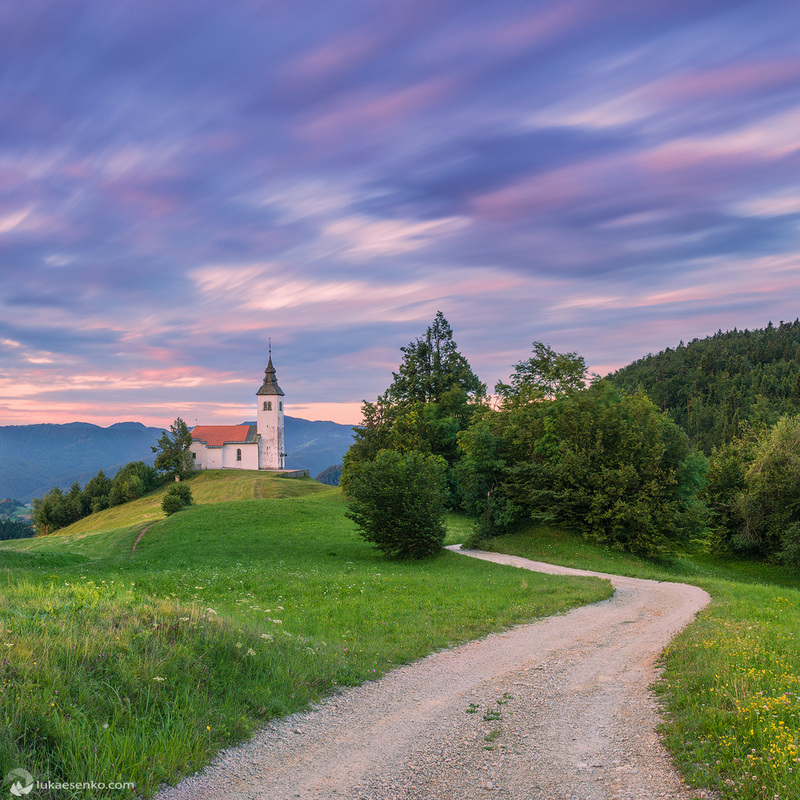 Yes, I know, another hilltop church, but this is one of the best things about Slovenia 🙂 Ana, my dear friend and fellow photographer joined me at this trip. Check out her wonderful portfolio! 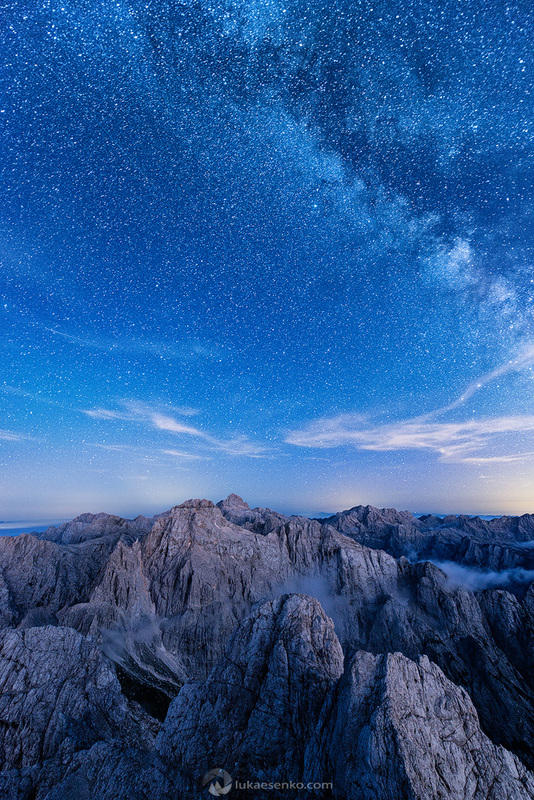 August: Panorama of the highest peaks of Julian Alps. Visible peaks: Rjavina, Razor, Triglav, Planja, Kanjavec, Lepo Špičje. August: Night in the Alps. A view from the top of Prisojnik (Prisank) towards Triglav. September: Hopping around Julian Alps. One of my favorite shots of the Alps of all times. I donated a print to my high school – Gimnazija Šentvid and the 3,5m print on the wall looks fantastic! October: A water curtain at Soča river, Triglav National Park. October: Fall is the best month to photograph in the Alps. Soča river with its emerald color and warm foliage colors make a great combination. October: A rural scene from the NE Slovenia. Photo taken from Plački tower, the location known because of beautiful photos of Peter Zajfrid. November: Košuta ridge bordering Slovenia (right) and Austria (left). Photo taken from Veliki Vrh, looking towards East. The whole ridge is about 9km long – a wonderful hiking with stunning view on both countries. November: Sweet light breaking through spruce forest on the slopes of Košuta. This and previous shot was taken on the same day, when Jošt, another talented photographer joined me for a cold night climb in the Alps. December: St Tomaž church at Praprotno village. This amazing location was shown to me by Piotr, Polish photographer living in Slovenia. A very popular photo lately, breaking all the records in views and shares on social media. for a reason – it is stunning scenery! December: Winter morning somewhere in Slovenia. This photo was taken from Vrh Svetih treh kraljev near Rovte. A couple of days ago I was pleasantly surprised that Lonely Planet has shared this photo on twitter – to 2 mln followers! I am pretty sure it will become a very popular place with photographers very soon. 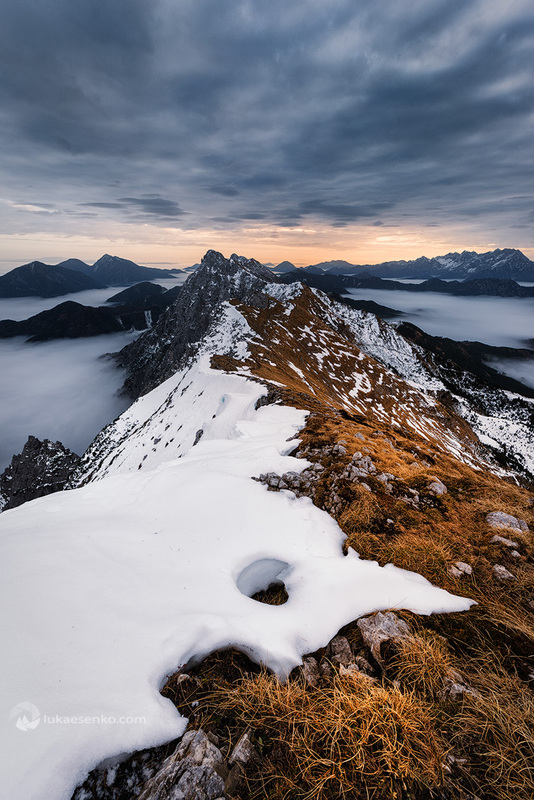 December: Triglav Almighty. My dear friend, very talented photographer Dan Briški took me to his secret places on the slopes of Pihavec. It was strenuous 15 hour endeavor, well worth as we ended up with incredible light at the end of the day! I hope you like the collection of my favorite shots. You are most welcome to share, in fact I will appreciate this very much. You can follow me on Facebook or Twitter where I post regularly. 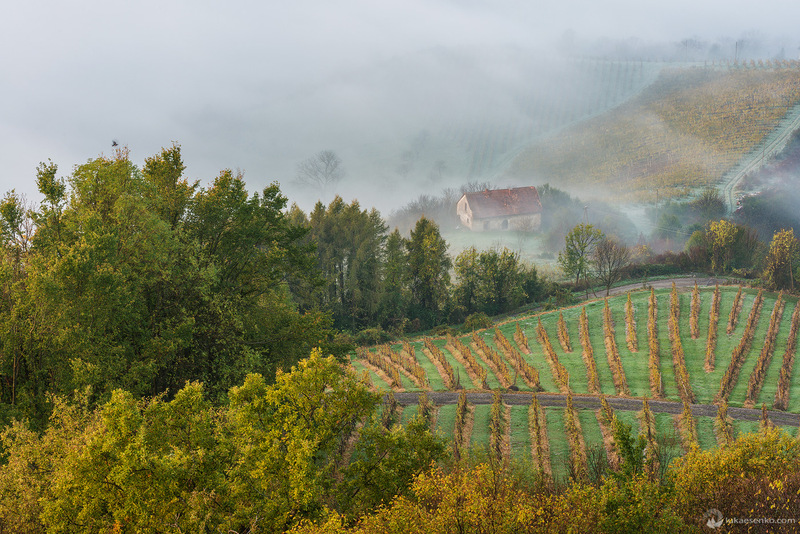 You can also join me on my photography tours and workshops in Slovenia or Croatia. Thank you and all the best in 2015! Gorgeous view of my 2nd home—Slovenia! Thanks for sharing. Very beautiful photos of a very beautiful country! Thanks for sharing. beautiful photos. i remember my last stay in slovenia a few years ago at lake bohinij. Aand i will be there again next summmer. You are always welcome back to Slovenia Steffen. Was impressed with your pictures. Slovenia is really beautiful. Does Slovenia tourism department sponsor press trips for journalists? Vrlo lepe fotografije, podsećaju me da je vreme da i mojoj porodici pokažem koliko lepih kutaka ima u Evropi! Bojan, hvala za prelepe slike naše lepe dežele. Tako smo bili navdušeni, da smo jih kar delili na naši Facebook strani. 😉 lep pozdrav od skupine Perpetuum Jazzile. Pri predzadnji sliki, posneti v okolici Rovt, je napaka pri imenu. Gre za Vrh Svetih Treh Kraljev in ne za Vrh Svete Trojice. Hvala za opozorilo Jože. Popravljeno! God made this beautiful wonderland for his “favorite” people to live in it and be joyful and prosper! Čestitam. Si kar predstavljam, da je bil sam izbor fotk najtežje letošnje delo. Hvala Tone, res ni bilo lahko izbrati gornje fotografije! Vau! Kupila bi koledar s temi fotografijami! made my first visit to my grandparent’s home country this September.what a beautiful country as your pictures show. Great photos. Excellent photos! Have you been to Plitvice and do you have photos from that park? I want to return to Slovenia in the future. Hvala lepa Mojca in lep pozdrav v Bohinj! These photos are stunning! Slovenia is a beautiful country! Izjemen izbor, veliko dobrih fotk želim še naprej! Čudovite fotografije. Najbrž je vloženega veliko truda, da si pravi čas na pravem mestu. Mislim, da tudi link do Ane rabi popravek, ker vrže na 404. Sicer pa čestitke za izredno lepe fotografije; najbolj se mi dopade zvezdnato nebo. These are just stunning photographs. Your country is one of my favourite places; so beautiful, friendly and with amazing walking. I’ll be there in August! Hi luka. Bravo you’re photo great. 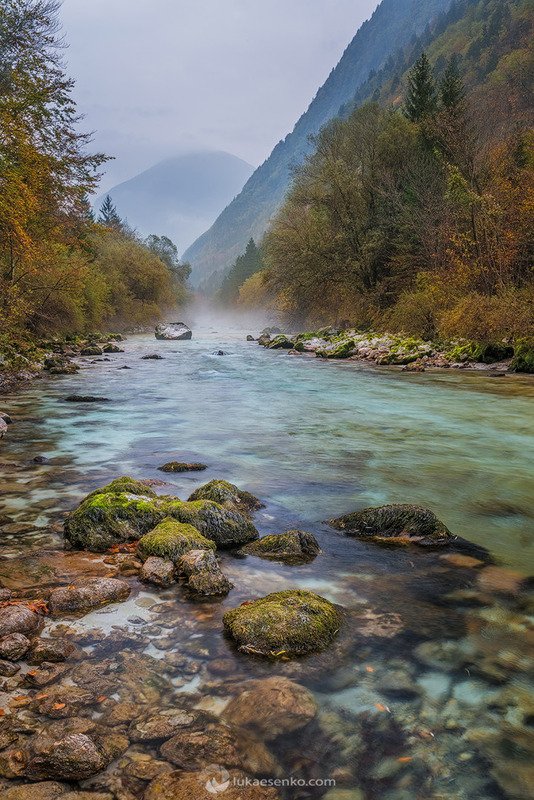 Someday I hope & pray my leg and health are good to take me to Slovenia – the place of all 4 of my grandparents’ births… what a beautiful country! Pictures are Breathtaking! Izjemna lepota zajeta v čudovite in kvalitetne footgrafije. Vse pohvale avtorjem. Great photos, you did an excellent job. Been to Ljubljana for a month long training at FELU. Fell in love with the country. Very beautiful, Nice people. Call it Heaven on Earth. zaradi tvojih fotografij sem ponovno zaljubljena v svojo deželo in ponosna ter srečna, da sem tukaj rojena. Hvala za ta čudovit občutek, ki ga bom z veseljem in ponosom delila z vsemi prijatelji doma in po svetu. Hvala Vladka! Lepo je slišati take besede in le delite naprej! Ma ja Luka, ni kaj dodati, vse si povedal s fotkami… go ahead. You are so lucky to have such diversity in a country the size of Slovenia. Great images as always! Thanks Jeremy! Good luck with your Nepal and Bhutan tour! After viewing these spectacular images I can’t wait for my trip in September when I can see some of these places with you and try to capture some of the beauty that you have in this collection! Hey Carol, looking forward to take you to some of these places! Sept will be here soon! Wow Luka.. What a beautiful pictures!! Slovenia having a wonderfull nature..
What a beauty,all the photos are awesome. I like your Trying. it is a grateful works. go ahead. Your lucky is there..
Oduševljen sam ovom ljepotom i umjećem da se osjeti i zabilježi. Hvala ti za ove lijepe trenutke! That’s genius. Thanks for sharing! Stunting photo Just beautiful Nature is great . Fell in love with the country. Very beautiful, Nice people. Thanks for sharing them . YOUR PICTURES ARE ALL VERY AWESOME AND I BECOME MORE APPRECIATIVE TO THE NATURE AND TO THE CREATOR WHO MADE YOUR COUNTRY A VERY NICE PLACE TO LIVE IN! IF TIME PERMITS ME TO SEE YOUR PLACE HOPING TO MEET YOU AND YOUR FAMILY SOMEDAY! Thank you for your kind comment Joereline! Hope to see you in Slovenia! really this is a beautiful place. I want to visit that place and enjoy a lot. Your best photos are made me speechless…It is amazing! Wonderful pictures! Many thanks for sharing. I also recommend you to make destinations in Africa in general and Ethiopia in particular as there are diverse landscapes and cultures. Sign me up for the news!